These commercial grade sectional canopy tents are an excellent addition to any party tent rental or event business, as well as the perfect party tent for your outdoor event, including weddings, graduations, church functions, reunions and more. Our 30' Wide Premium Sectional Pole Tents can accommodate large parties of guests, are easy to set up and made from durable, high-quality materials. 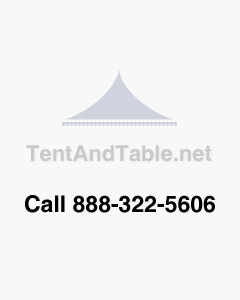 Pole tents get their classic look from the center tent pole that supports the vinyl tent top, which is then stretched across to the side poles. The multi-piece sectional tent tops are waterproof, flame resistant, UV resistant, mold resistant and mildew resistant. The fabric is a heavy-duty 16oz blockout vinyl that will not show staining and has a durable finish. The side and center poles are constructed from anodized aluminum that is lighter in weight than steel, highly resistant to rusting and corrosion, ultra-durable and won't stain your tent top vinyl. These high-quality commercial vinyl pole tents are built to last and designed to withstand the wear and tear of being set up and taken down multiple times each year. Please note: Sidewalls are sold separately, the tent does not include any sidewalls. Tops are made with mildew resistant, flame retardant material. Reinforced aluminum plates are sewn into top all points for heavy-duty installation. All panels are bonded with 1" heat-sealed overlapped seams. Scalloped valances bond with vinyl binding. Permanently attached 1/2 diameter polyester rope with rope tensioners. Guy ropes and jump ropes are spliced in at each pole location. Detailed installation instructions are sewn into a tent top storage bag.